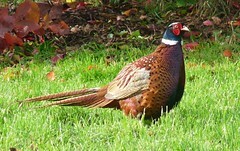 A pheasant in my garden. Isn’t he beautiful. You can read more about pheasants on the RSPB website – click here. A large, long-tailed bird. Males have rich chestnut, golden-brown and black markings on body and tail, with a dark green head and red face wattling. Females are mottled with paler brown and black. They were introduced to the UK long ago and more recent introductions have brought in a variety of races and breeds for sport shooting. Every year in Britain, more than 45 million pheasants and partridges are mass produced inside hatcheries and rearing sheds. From the sheds, they are moved to fattening pens before being released to serve as feathered targets for shooters. I cannot stand it! I can’t believe that these fools get enjoyment out of it! The worst part for me, is explaining to my girls why these people to it! My answer, is for amusement!!! your welcome sharon, and your right, they were here before us, and they’ll all be here long after we are gone. PLEASE BE AWARE THAT BEFORE YOU WASTE YOUR TIME ADDING COMMENTS WHICH ARE RUDE, OFFENSIVE, AGGRESSIVE, VULGAR OR PERSONAL – ALL COMMENTS ARE CHECKED FIRST & ANYONE WHO CAN’T ARGUE THEIR POINT IN A POLITE, CIVILIZED MANNER, WILL NOT HAVE THEIR COMMENTS PUBLISHED. THIS IS NOT A PUBLIC FORUM, IT IS MY PERSONAL BLOG AND I DECIDE WHAT GOES ON HERE. I LOVE TO HEAR OTHER OPINIONS, AND I LOVE TO DEBATE ISSUES BUT SOME OF THE COMMENTS LEFT ON HERE RECENTLY ARE JUST NOT ACCEPTABLE AND HAVE BEEN DELETED. Next PostNext Tumbling towards the Tipping Point?